The Paris Opera Ballet is one of the oldest and most prestigious institutions in the world. It obtained its stamp of nobility from its creator, King Luis XIV of France, in the late 17th century. In 1669, the Opera Academy was founded, later changing its name to the Royal Academy of Music, and providing the base for the future Royal Academy of Dance the Paris Opera School of Dance (1713). Over its long and fruitful artistic career, the Paris Opera Ballet has been carving out a repertoire made up of master works from the great repertoire of ballet classics and modernising itself with creations by young, intelligent contemporary choreographers. In dance, stylistic diversity is synonymous with evolution, and the French institution knew it had to keep up with the times. After so many years as one of the most hierarchical artistic institutions, what is the likelihood of being able to access its roots and learn about its most unknown corners? Getting a look behind its walls and discovering its reserved and real intimacy is an impossible dream. Just because something can be imagined does not convert it into reality, and although our mind is capable of imagining infinite worlds and infinite realities, this does not mean that they actually exist. In this case, there is a possibility; in the form of a documentary, two hours and forty minutes long, created by Frederick Wiseman (1935). Wiseman is one of the great documentary filmmakers of our time. A lover of ballet and with a long and successful career behind him, in 1995 he followed the American Ballet Theatre during their rehearsals and performances in New York and Europe. The result was the first film of this genre, entitled Ballet. In La Danse, with his invisible camera – which nobody ever seemed to be bothered about– a wealth of information is revealed about the company. The director delves into the intimate functioning of the French institution and manages to make it visible to the viewer. Even though I thought it was an excellent story, that I liked a lot, I do not consider it a great work. It fails to show the viewer anything beyond the obvious, the visible and, of course, what the Ballet wanted to be seen. Everything is neat and careful. 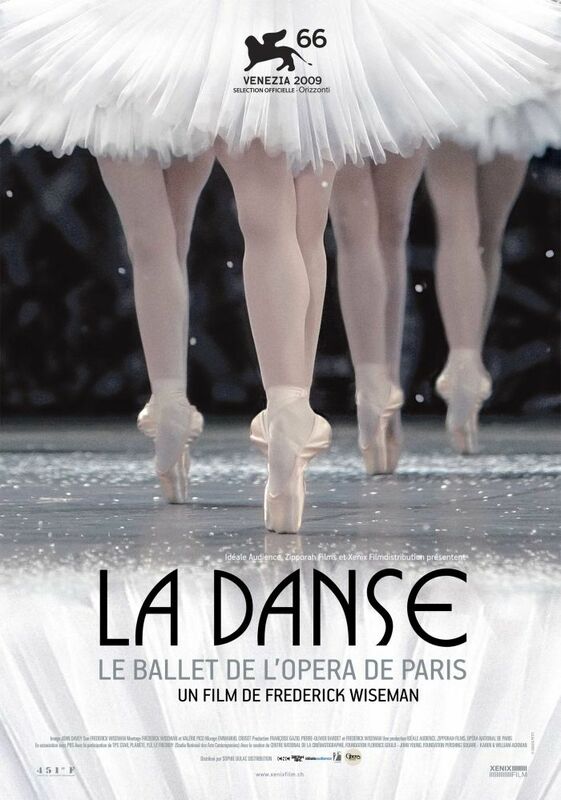 For this journey of discovery and selected revelations to be accessible, one must know the high world of French ballet since, at no time during the film is the viewer offered information about the identity of the characters, the ballets being rehearsed (and later performed) or whom they are watching at work. There is no voiceover, interviews or titles that explain anything. With his film, Wiseman wants to show people the day-to-day lives of the group: through sequences of technical classes and quite a lot of rehearsals (somewhat tedious), revivals of ballets in the repertoire, new works that will form part of their avant-garde productions, the stage, the galleries, the Grand Foyer, the basements, the roof etc. In short, the film offers nothing new for those of us who know the immense and demanding work that goes on in cultural institutions of this ilk, although it is very appealing to those who do not have much knowledge about the subject. It has to be noted that the film explains little or almost nothing about the work carried out by wardrobe, shoemaking, and hairdressing experts etc., thus failing to contribute to further understanding about the work of the most important professionals in these arts. There are some very nice conversations in the film, however. For me the most interesting conversation is that between the married couple Ghislaine Thesmar (1943) and Pierre Lacotte (1932) in the middle of a rehearsal of a pas de deux in the revival of Paquita, with an extraordinary Agnès Letestu and her partner, Hervé Moreau. Also noteworthy is Brigitte Lefèvre’s telephone conversation regarding the funeral of Maurice Béjart. Don’t miss it! Brigitte Lefèvre (1944), the powerful artistic director of the Paris Opera Ballet, is the person who organises, structures and emotionally and intelligently contains its members. Above all, it is clear that its strength lies in quality, and this is evident at key moments. Her decision-making power is irrefutable, reflected in decisions as diverse as the cast of dancers in each work, instructions to choreographers, dealing with sensitive issues with investors, and also in the battle with trade unions to put forward a request to the Ministry of Culture about retirement benefits for the artists. Her power and patience seem to be infinite. The great respect with which Lefèvre speaks about the artists, especially the leading figures, is worthy of admiration. She makes it clear, at all times, that her Etoiles are very generous in agreeing to work with new choreographers. She expresses her respect for them by thanking them for their talent, work, and dedication. Laurent Hilaire (1962), ballet master and Patrice Bart (1945), ballet master associated with the direction of ballet, are present in the daily work, as is the ballet mistress Clotilde Vayer. The film does not mention the Ballet School, and it is because of this that we notice the great absence of its director, Élisabeth Platel (1959), and other known figures as, this time, Wiseman’s work is focused purely and exclusively on the ballet company itself. The characters are real and extraordinary, the dancers are the ones who make the documentary, they don’t say anything or give opinions, they only obey, nodding their heads or, at the most, respond monosyllabically to the instructions of the teachers or rehearsal masters. Except for Agnès Letestu in a rehearsal with Pierre Lacotte. The film’s direction is impeccable, and the production superb. The documentary does not have narrative evolution, since its pattern is repetitive, and the same information is repeated time and time again; rehearsals, instructions, functions, images of the building etc. This means that those who are not ballet lovers, or do not understand the art, can find it monotonous and, perhaps rightly so, boring. «An artist does not always have an explanation for what he/she does; it is the spectators who have to find it» said Jean Cocteau (1889–1963), as Laurent Hilaire (1962) reminded Emilie Cozette (1981). You have to see this documentary, which is a valuable source of information. Genus, by Wayne McGregor; El sueño de Medea, by Angelin Preljocaj; La casa de Bernarda, by Mats Ek; Paquita, by Pierre Lacotte; The Nutcracker, by Rudolph Nureyev; Orphée et Eurydice, by Pina Bausch, and Romeo and Juliette, by Sasha Waltz. The ballet class given by Andreï Klemm. José Martínez rehearsing his variation in the final act of Nureyev’s Nutcracker.Emilie Cozette interpreting Medea with Preljocaj. Brigitte Lefèvre ’s conversation with the Israeli choreographer Emanuel Gat. Lefèvre telling Gat about their new works with the Paris Opera Ballet. Agnes Letestu and Hervé Moreau rehearsing Paquita in front of Thesmar and Lacotte. Benjamin Pech and Marie-Agnès Gillot rehearsing McGregor’s Genus. A fragment of Medea, by Preljocaj, interpreted by Delphine Moussin, where she kills her children. An extraordinary Marie-Agnes Gillot in a stage rehearsal of Paquita. Marie-Agnès Gillot, Laëtitia Pujol and other dancers in an intense moment of shouting in The House of Bernarda by Ek. Dominique Merci explaining Orphée and Eurydice by Bausch. The few shots in the tailoring and hairdressing departments, and the windows of the Garnier Opera building. The performance of the opera-ballet "Romeo and Juliette" by Sasha Waltz by Aurélie Dupont and Hervé Moreau in the Bastille Opera. Gerard Mortier with Lefèvre, during his time as Director of the Garnier Opera and the Bastille Opera.